Dear community. Did anyone of you happened to experience the work of Satya Brat? What are your thoughts? Please be as judgmental as you can both positively and negatively. I have not experienced his work directly, only heard less than positive things second hand - mainly that his weekend bowl workshops were mostly a sales pitch to get you to buy a lot of bowls, but I can't comment on any substance or lack of beyond that. 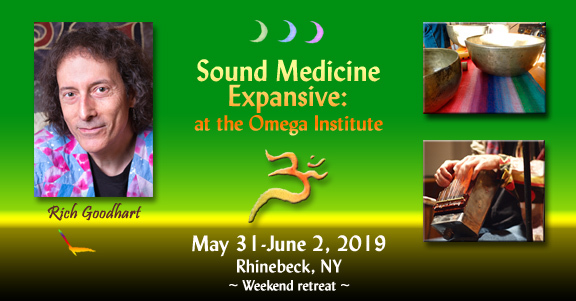 World's leading GONG STAR.... Join us in New York City, March 22 - 25, 2018"
"Participants....will be able to integrate this valuable skill the very next day in their personal & professional healing work...."
and additionally, any of this taken on the level of "learn a technique in a weekend and use it professionally (i.e., sell your services) the very next day" is grossly misguided, in my perspective. You don't become a "healer" by paying out a pile of money for a quick crank 'em out 'factory' training and a certificate. You can't bypass the self-discovery, the awakening, the opening up of perception and sensitivity, the cultivation of awareness, skill and depth. All of this takes time and dedication - it just doesn't happen in a flash. Other's perspectives, experience and opinions may vary. Guy, have you experienced his work? I know Satya Brat, I've spent time with him, I evaluated a paper he delivered at a Music Therapy conference once, after he delivered it. In one word I can describe him - fraud. A know nothing (actually he steals research from others and calls it his own), excuse for a teacher. A snake charmer. Totally full of himself at the expense of others. Avoid at all costs. Gentleman, thank you for your replies. Satya has a workshop on this Tuesday. I am planning to pay 49$ yes :) esoterical 49 and askl him in front of everybody a couple of questions. Gentleman, thank you for your replies. Satya has a workshop on this Tuesday. I am planning to pay 49$ yes 😉 esoterical 49 and askl him in front of everybody a couple of questions. I'll be curious to hear of your experience. Please let us know. Next week he has a four day workshop in NYC..... it's $999.... I won't be attending! Yeah, I know. Will definitely share with you . Have to clear it from my space. I am taking it personally. Looking forward to your findings Guy. Enjoy the event. So how did it go? I think we know what's what, but it would be cool to hear how it went GB! Here is detailed description of my experience. Oh wow! Good work on letting your light shine in dark places BroThor! You are a brave soul!